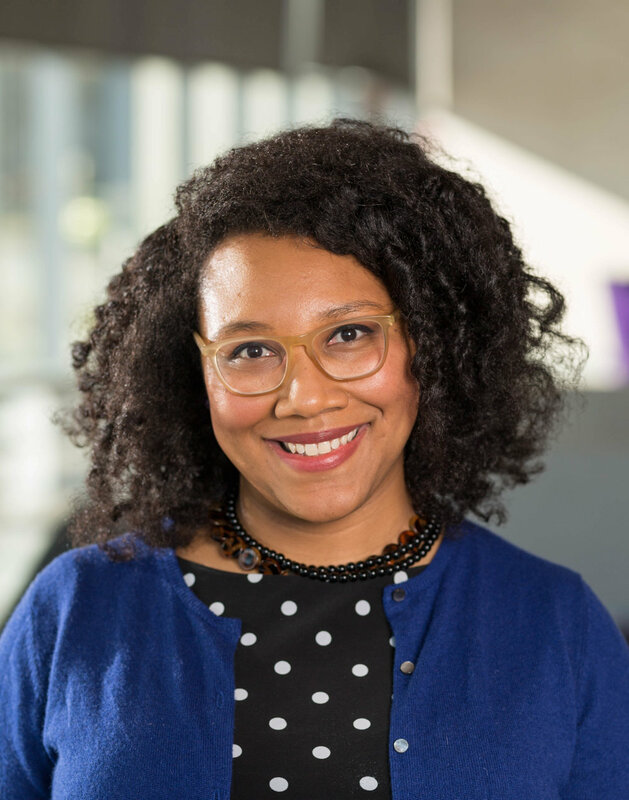 Dr. Sylvia Perry is the Principal Investigator of the Social Cognition and Intergroup Processes (SCIP) Lab at Northwestern University. She is originally from Raleigh, North Carolina. She completed a bachelor's degree in Psychology at the University of North Texas in Denton, Texas (2002), and she received her master's (2006) and doctorate (2010) in Social Psychology from the University of Illinois at Chicago, where she was mentored by Drs. Linda Skitka and Mary Murphy. Dr. Perry was a National Institutes of Health postdoctoral associate at Yale University from 2010-2014 under the advisement of Drs. John Dovidio and Michelle van Ryn (Mayo Clinic). Dr. Perry was an Assistant Professor of Psychological Science at the University of Vermont (UVM) from 2014-2016. In the summer of 2016, she joined the faculty at Northwestern University, where she is an Assistant Professor of Psychology. Dr. Perry investigates how bias awareness develops, and the implications of bias awareness for prejudice reduction, intergroup contact, and health disparities. She is excited to continue to develop her work at Northwestern. In her spare time, Sylvia likes to read graphic novels, collect designer toys, and discover new music. She and her husband also enjoy spending time with their adorable son, Henry. Dr. Allison Skinner is a postdoctoral scholar in the Social Cognition and Intergroup Processes (SCIP) Lab at Northwestern University. She completed a bachelor's degree (2005) and master's degree (2009) in Psychology at California State University, Chico, and she received her doctorate (2015) in Experimental Psychology (emphasis on social psychology and neuroscience) from the University of Nebraska-Lincoln. Dr. Skinner was formerly a postdoctoral research associate at University of Washington from 2015-2017 under the advisement of Drs. Kristina Olson and Andrew Meltzoff. Her research is centered on developing an understanding of the causes and consequences of subtle social bias (e.g., implicit racial biases). In her research she examines how subtle social biases are activated and spread among children and adults. Click here for Allison's website. In her spare time, Allison likes to cook, salsa dance, practice her French, and travel the world. James is a third-year Ph.D. student in social psychology at Northwestern University. He broadly studies the ways in which social characteristics influence what we think and feel about people. James tends to focus on how beliefs about race and gender impact the way we interpret ambiguous and uncertain social situations, such as when someone takes risks. James earned his bachelor of arts degree in psychology from the University of Arkansas (2013) and his master of science degree in psychology from Northwestern University (2018). He enjoys spending time on the Lakeshore, discovering Chicago arts and music, and exploring local neighborhoods and foods. Sirenia Sanchez is a first year graduate student in the Social Psychology Ph.D. program at Northwestern University. She works in the SCIP lab under the advisement of Dr. Sylvia Perry, where she studies the psychological effects of and intergroup dynamics related to cultural appropriation, and intragroup discrimination/prejudice within the Latinx community. Sirenia received her Bachelors of Arts in Psychology and in Communication from the University of California, Santa Barbara. As a McNair Scholar she worked with Dr. Nancy Collins to investigate the influences self-esteem has on self-disclosure in close interpersonal relationships. In her free time, Sirenia enjoys talking with friends over beer, catching up on films she’s repeatedly been told to watch, and jogging (when it’s not cold outside). She also really enjoys cooking and is always open to hearing and trying out new recipes. Elinam Ladzekpo is an incoming first year graduate student in the Social Psychology PhD program at Northwestern University under the advisement of Dr. Sylvia Perry. Elinam is currently a lab manager for Dr. Mary Murphy’s Mind and Identity in Context Lab at Indiana University. Prior to this, she received her Bachelors of Arts in Psychology from the University of California, Los Angeles. As a McNair and Departmental Honors Scholar, she investigated Whites’ perceptions of Black women providing negative critical feedback. Her current research investigates perceptions of marginalized individuals, intragroup and intergroup prejudice within communities of color, and individual differences that reduce or increase the discrimination experienced by marginalized groups. In her free time, Elinam enjoys reading, cooking, watching movies and tv, and traveling. Elisa Rapadas is an incoming first year graduate student in the Social Psychology Phd program at Northwestern University under the advisement of Dr. Sylvia Perry. She was a Summer Research Opportunities Program (SROP) Fellow in the SCIP Lab in Summer 2018, where she studied the relationship between ostracism and gender stereotype-consistency with Dr. Allison Skinner. She is interested in studying intragroup prejudice/colorism and anti-Black racism within Asian and Pacific Islander communities, and how stereotypes and bias are developed and transmitted between different cultural contexts. She is currently a fourth year student at Saint Mary’s College of California majoring in Social Psychology, where she works as a Resident Advisor and Psychology Departmental Assistant. Her senior capstone, under the mentorship of Dr. Paul Zarnoth, tests how the importance of different identities can influence self-efficacy in women in STEM. In her free time, she enjoys reading classic science fiction, watching movies on bargain days listening to NPR and indie rock (not at the same time), and baking. Adilene graduated from Dominican University in 2017. She completed her bachelor’s degree in Psychology with a minor in Spanish Studies. As an undergraduate and under the guidance of her mentor, Dr. Tina Taylor-Ritzler, Adilene studied ways to buffer the effects of stereotype threat on the academic performance of Latinx students. Adilene is thrilled to be working in the Social Cognition and Intergroup Processes (SCIP) Lab at Northwestern. At the SCIP lab, Adilene has been able to explore research on intergroup relations, the development of bias, and the spread of bias through nonverbal behavior. Additionally, Adilene has been able to collaborate on projects examining the relation between group norm consistency, ostracism, and well being. Her current research interests focus around understanding the effect of intragroup prejudice among Latinx individals. Adilene is interested in pursuing a doctoral degree in Clinical Psychology and is thrilled for the opportunity to further develop her understanding of the research process. In her free time, Adilene enjoys reading, drawing and painting, and exploring new places. Brandon majored in Psychology at Franklin & Marshall College in Pennsylvania and received his bachelor’s degree in 2019. As an undergraduate, Brandon’s senior thesis examined the effect of intertemporal uncertainty on the prosocial actions of adolescents during puberty. This project was completed under the guidance of Dr. Kristi Leimgruber. Other notable research projects were examining the effect of consciousness on sexual assault distress and symptomatology as a collaborative effort under the guidance of Dr. Michael Penn, and math anxiety’s effect on top-down and bottom-up processing under the guidance of Dr. Alex Moore. Brandon is excited for the opportunity to learn from the diverse members of the Social Cognition and Intergroup Processes (SCIP) Lab at Northwestern. He is interested in gaining a greater understanding of intergroup processes and how interactions can vary as a result of factors such as ethnicity and affiliations. He is also interested in seeing how and when social biases form and how they are spread through channels such as media, educational settings, and parental lessons. Brandon looks forward to new collaborations and assisting in furthering the current knowledge on these topics. In his free time, Brandon enjoys track and field, cooking, playing board games, and meeting new people and exploring new places. Fariha is a second year pre-medical student at Northwestern University majoring in Psychology. She is extremely grateful for the opportunity to join SCIP lab and is deeply interested in the interactions of identity within society as well as the effects of implicit and explicit biases in the social realm. She feels that working in the lab will give her a valuable opportunity to become involved in research that helps her better understand the world around her and hopes to explore a similar line of research as related to healthcare services in the future. In her spare time Fariha enjoys swimming, painting, and indulging in Yelp-fueled visits to a diverse array of local coffee shops. Off campus, Fariha spends time managing her responsibilities as Outreach Chair at Hayat Clinic, a local charity clinic that provides that aims to provide completely free services to all, as well as managing her duties as the co-founder of ILM, an organization that attempts to provide underprivileged children with educational support. On campus, Fariha is a member of Community Health Corps, an organization that connects the local community to health resources and is a member of Phi-Delta-Epsilon, a pre-medical fraternity. Bella is a fourth-year pre-medical student at Northwestern University, pursuing a major in Neuroscience and a Sociology minor. Bella is very excited to join the SCIP lab as she is very interested in the connection between psychology and its biological responses. She feels that exploring this relationship between psychology and biology, as well as participating in research studies, will help her in her pursuit of medicine. Bella first discovered her interest in studying the development of implicit bias through her sociology classes at Northwestern and also believes that learning about these biases from a psychological standpoint will improve her understanding about them. Bella is also involved in her sorority as Assistant Vice President Member Education of her sorority as well as a member of the rowing team. Bella also enjoys service work, she is involved in her sorority’s philanthropy committee and a member of GreekBuild which is a service organization within the Greek community at Northwestern. In her free time, she can most likely be found catching up on her Netflix shows and enjoying the Downtown Evanston atmosphere with her friends. Daniel is a third-year at Northwestern University pursuing a major in Psychology. Daniel is excited to be a part of SCIP Lab, where he is motivated to learn about and understand the different aspects behind stereotypes and social attitudes. He also hopes to gain a better understanding of the processes behind conducting research and interpreting and applying data. Some of Daniel's own research interests include how culture plays a role in the creation of implicit biases and the strength of groupthink. In his free time, Daniel enjoys playing Rocket League and powerlifting. He also likes to discover new music and books, play the ukulele, and DM a Dungeon's and Dragons campaign for his buddies! Fiona is a current student of Northwestern’s School of Professional Studies Preclinical Psychology Program. She received her Bachelors of Arts from Colorado College where she majored in Anthropology and minored in Religion. As an undergraduate, Fiona studied the different roles that religion plays in distinct communities, and how these differences affect group cohesion. She also served as a research assistant for Dr. Esteban Gomez and his archaeological research on pre-Colombian sites in Costa Rica, and was awarded the H. Marie Wormington Award for her undergraduate achievements in Anthropology. After graduation, Fiona spent time working in non-profit and pursuing her passion of long distance backpacking. Her interest in psychology developed as she searched for a way to more directly impact the lives of others. This led her to Northwestern’s post-baccalaureate program in Preclinical Psychology, which offered the ideal opportunity to change academic tracks. Fiona is thrilled to be expanding her understanding of the field by contributing to the fascinating work underway at the SCIP lab. She is especially interested in the subtle ways that sexism and discrimination affect achievement and motivation, how subtle biases are communicated between loved ones, and what factors contribute to empathy versus intolerance. In her free time, Fiona enjoys volunteering at PAWS Chicago, going on urban bike adventures, sampling Chicago’s breweries, and hunting down the best vegan food in the city. Ala is a second-year student at Northwestern University. She is majoring in Biology and Psychology, and minoring in Spanish. Ala is volunteering at SCIP to learn about the formation and manifestation of implicit biases as well as performing research in social psychology. She would love to study how implicit biases affect attraction to people of different identities, or how they affect our relationships as a whole. Ala is also interested in the intersection of psychology and biology: for example, what we can learn from physiological responses and their causes. In her free time, Ala loves to paint, dabble in guitar, and explore music as a whole. On campus, Ala is a student supervisor at ARTica Studios, where she gets to express this creative side. She is also a Peer Adviser, serving as a mentor for new Northwestern students throughout their first year. Ala also volunteers with the New Life Volunteering Society, a health-focused group that serves the local Evanston and Chicago communities. In her sorority, she assists in planning community service events, designing merchandise, and advertising philanthropy events. Thomas is a sophomore, double majoring in Psychology and Asian Languages and Cultures with a focus in Japanese. Thomas hopes to use his time working in the lab to understand biases that shape our lives and ways in which we can create a more inclusive environment. He plans to become a clinical therapist, and wishes to gain insight on social understandings through his time at SCIP to incorporate into practice. During his free time, Thomas hosts quarterly shows on 89.3 FM WNUR. He actively searches for underrepresented music to play on air and expand his taste. Thomas also writes for and takes pictures of live concerts in Chicago for WNUR Media Team. With some of the friends he’s made doing this, he plays drums in various bands on and off campus. Noelle is a fourth-year pre-medical student at Northwestern University with a Psychology major and English Literature minor. She is thrilled to be joining the SCIP lab and looks forward to learning more about the manifestations of unconscious biases as well as gaining research experience, both of which she believes will be deeply valuable to pursuing a career in healthcare. She is very interested in the development of implicit biases and internalized stigmas in children of young ages. Noelle is also a work-study student at The Cradle Adoption Agency and Internal President of GreekBuild, a service organization within the Northwestern Greek community. When not studying or babysitting, she can most likely be found playing around on Photoshop in a cafe or exploring her beloved hometown of Chicago. Lynn Liu is currently working as a Senior Analyst in a consulting firm while trying to explore the social psychology world which she has discovered to be her true calling after synthesizing her interests. She is very grateful to be able to contribute to the SCIP lab utilizing her background in predictive analytics while learning research design methods in this field. She is interested in how bias awareness develops and the effective ways to reduce prejudice, believing that the more knowledge she can gain about the root cause of the current social issues, the more she can contribute to the society. She is also interested in the intersections of social justice, machine learning, mindfulness, and meditation. In her free time, she enjoys mindfulness practice, meeting people from different backgrounds, learning different music genres, playing tennis, appreciating nature, staying spontaneous, etc. She is motivated by “meaning and experience” in her life philosophy. Allegra Maeso is a third-year student at Northwestern University. She is majoring in Cognitive Science and minoring in Spanish and Legal Studies. Allegra is volunteering at SCIP to gain a better understanding of the mental processes involved in bias and prejudice, and how these thoughts affect interactions with others. She is hoping to gain a better understanding of how research can be applied to change and educate people. Allegra is interested in studying racial biases in policing and hopes to ultimately engage in prison and criminal justice reform. In her free time, Allegra enjoys playing basketball and going on roadtrips. On her bucket list is to drive to all 50 states. She also loves performing card magic, watching comedy, and walking her rescue yorkshire terrier, James. On campus, Allegra is involved in the student group Mixed Race Coalition, the women's club basketball team, and the Undergraduate Prison Education Program. Jennifer Martinez is a fourth year at Northwestern University with a major is Psychology and a minor in Latinx Studies. Jennifer is excited to be volunteering at the Social Cognition and Interpersonal group lab this summer as a SIGP Fellow. She is interested to learn more about the process of research design while gaining more research experience. In her free time, Jennifer enjoys attending concerts and spending time with her dogs, Lilo and Frida. She likes to explore downtown and find new restaurants. On campus, Jennifer works as a Jumpstart Corps Member promoting literacy skills in preschool children. She is also a member of Kappa Delta Chi Sorority, Inc., a Latina founded service sorority. Ramon Pelayo is a fourth-year student at Northwestern University where he studies biology and psychology. Ramon is really interested in studying how people work through a biopsychosocial approach. In his developmental psychology and social psychology classes, Ramon became interested in the development of racial identity and implicit bias and how racial identity and implicit bias affect how individuals function in different environments. By working in the SCIP Lab, Ramon hopes to be able to explore these interests and psychological research more broadly. Heather A. Perkins earned her bachelor’s degree from DePaul University where she double-majored in English and African and Black Diaspora Studies (2013) and completed a clinical track master’s degree program from the University of Chicago, School of Social Service Administration (2017). Shortly after graduation, Heather proudly accepted a position at Ulhich Children’s Advantage Network (UCAN) where she provided therapy services and facilitated psychoeducation groups to participants in the Violence Intervention Prevention department. Heather’s therapeutic methodologies included psychotherapy, CBT, and SPARCS. Currently, Heather serves as a member of the City of Evanston’s Mental Health Board and is an active member of her sorority. Heather admires Dr. Perry’s body of work, in particularly, as it relates to researching social biases in the medical/healthcare field. So Heather is ecstatic to join SCIP Lab to strengthen her experience in a psychophysiological and dyadic interaction and develop her framework in research as she prepares to apply to PhD programs . In her free time, Heather enjoys reading, writing, and most importantly traveling with her husband and two daughters. Kelsey Phalen is an undergraduate student with a double major in Theatre and Psychology. Kelsey's general interests (in both art and research) involve exploring connections between people and the barriers that exist against that, conscious or otherwise. She is super excited about exploring the role of implicit bias through a research lens. Outside of the lab, Kelsey can be found working on student theatre productions as an actor, director, and costume designer. In her free time, Kelsey enjoys befriending every dog she comes across, going to concerts, and playing the Sims. Mia Weed is an undergraduate student at Northwestern University pursuing a major in Psychology. Mia is incredibly excited and grateful to be having her first research experience with the SCIP Lab, where she hopes to learn more about the salience and nature of racial biases as well as the process and methodology of psychological research as a whole. She is very interested in the tumultuous relationship between racial justice and science and hopes to contribute to a world in which ethical methodology and scientific rigor can coexist. In her free time, Mia enjoys participating in theatre as both an artist and an audience member, writing comedy, and torturing her friends with nerdy psych jokes. She hopes to continue to be politically active both on campus and off. Check out our alumni here. Farrah, not to be confused with the late great Mrs. Fawcett, has a bachelors in dog treats and a masters in belly rubs from Cute Pets U. Farrah studies how vacuums are secretly plotting to take over the world. In her spare time, she enjoys long walks, barking at squirrels, and chewing on her parents' "good" shoes. She is excited for all the attention she will be receiving from the SCIP Lab and Psych Dept.